Speaking to the media on Thursday, Seahawks general manager John Schneider indicated Russell Wilson‘s four-year, $140MM extension won’t impact the status of franchise-tagged defensive end Frank Clark, tweets Bob Condotta of the Seattle Times. Seattle had already accounted for a new Wilson deal when it decided to tag Clark at a one-year rate of $17.128MM. 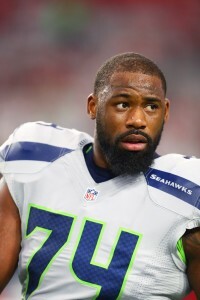 Schneider also admitted the Seahawks haven’t made a decision on offensive tackle Germain Ifedi‘s fifth-year option for 2020, and singled out linebacker Bobby Wagner and defensive tackle Jarran Reed as extension candidates (Twitter links via Brady Henderson of ESPN.com and Condotta). Wilson received an NFL-record $65MM signing bonus as part of his new Seahawks contract, but he won’t actually collect all that money immediately. He’ll earn $30MM of the bonus this year with the rest deferred until 2020, per Joel Corry of CBSSports.com (Twitter links), who notes this mechanism is common in most quarterback deals. The deferral won’t affect Wilson’s cap charges, as the $65MM will still be prorated over the next five seasons. Corry adds Wilson received better cash flows on his current extension than on his previous four-year, $87.6MM pact. Authorities have recently removed Chiefs wide receiver Tyreek Hill‘s three-year-old son from Hill and his fiancee’s custody, according to Laura Bauer, Brooke Pryor, and Steve Vockrodt of the Kansas City Star. Hill is under investigation for a pair of incidents involving child abuse, but still showed up for workouts earlier this week. The NFL is expected to allow the investigation to unfold before considering discipline for Hill. The Broncos want to bring in a third quarterback, but that player is likely to be either a young veteran or a draft pick, head coach Vance Joseph tells Mike Klis of 9News (Twitter links). Denver is apparently content to allow Trevor Siemian and Paxton Lynch battle it out for the starting QB job, meaning any new addition would be a third-stringer. Tony Romo, meanwhile, is looking like less of an option, as the Broncos are reportedly backing off their pursuit of the Cowboys signal-caller. After losing defensive tackle Stacy McGee in free agency, Raiders general manager Reggie McKenzie admits his team may bring in another piece up front, as Vic Tafur of the San Francisco Chronicle tweets. Currently, Oakland boasts Khalil Mack, Jihad Ward, Dan Williams, Mario Edwards, restricted free agent Denico Autry, and others along the defensive line. Johnathan Hankins, Jared Odrick, and Vance Walker rank as PFR’s best remaining interior defenders. The Chiefs‘ decision to decline their option on backup quarterback Nick Foles was purely cap-related, head coach Andy Reid tells Terez A. Paylor of the Kansas City Star. Foles’ 2017 option was worth $6.75MM, an untenable figure for the Chiefs given that even now they only have $3MM in cap space. While Foles has since signed a two-year, $11MM with the Eagles, Kansas City currently has Tyler Bray behind starting quarterback Alex Smith. Although Seahawks corner Pierre Desir had an opportunity to sign with the Lions last season, he opted to stick on Seattle’s practice squad and has since been re-signed on a futures deal, according to Bob Condotta of the Seattle Times (all Twitter links). Seahawks general manager John Schneider pointed to Desir, Neiko Thorpe, and Tampa Bay import Bradley McDougald as key depth pieces that can fill out the secondary. Free agent signee Oday Aboushi will begin his Seahawks tenure at right guard, which means Seattle is set to try 2016 first-round pick Germain Ifedii at right tackle, tweets Condotta. 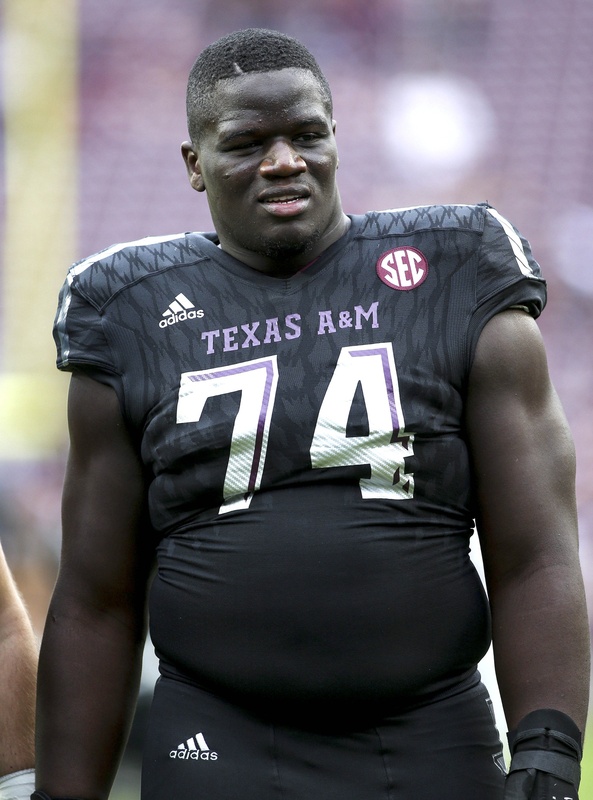 Ifedi played tackle at Texas A&M, but shifted to right guard during his rookie campaign. The results were near disastrous, as Ifedi graded as the single worst guard in the NFL, per Pro Football Focus. Seahawks first-round pick Germain Ifedi suffered a high-ankle sprain in practice yesterday, a source tells Ian Rapoport of NFL.com (on Twitter). The injury will sideline the offensive lineman for a few weeks. Ifedi was slated to start for Seattle at guard and the team’s confidence in his ability to play right away surely played a factor in their decision to cut former Pro Bowl guard Jahri Evans this offseason. With Bradley Sowell, Mark Glowinski, Justin Britt, and Garry Gilliam taking up the other starting spots on the O-Line, the Seahawks will probably have to turn to third-round rookie Rees Odhiambo to fill in for Ifedi. Ifedi was selected with the 31st overall pick after the Seahawks traded down from No. 26. Because the Patriots didn’t have a first-round pick this year, the former Texas A&M lineman represented the final pick of the 31-player first round. The Seahawks are planning to start Ifedi on the interior line for now before eventually moving him to tackle. The Eagles have been shopping defensive lineman Taylor Hart around the NFL, according to Jason La Canfora of CBS Sports (Twitter link). Hart doesn’t have an overly appealing track record in the league, however. The 2014 fifth-round pick from Oregon was on the Eagles’ 53-man roster throughout his rookie year, but he failed to log any appearances. In 14 games last season, the 6-foot-6, 281-pounder partook in 27 percent of the Eagles’ defensive snaps and made 27 tackles. Giants owner John Mara the Josh Brown situation on Wednesday and said the club was in fact aware of both the domestic allegations against the kicker and his arrest (via Jordan Raanan of ESPN.com). Nothing has happened since to change the Giants’ opinion on re-signing him in April. Because the Seahawks made such a minimal investment in Jahri Evans (one year, minimum salary benefit with $80K guaranteed), it’s uncertain if the veteran guard is a lock for the club’s final roster. As Bob Condotta of the Seattle Times writes, Seattle is pleased with the play of left guard Mark Glowinski and first-round right guard Germain Ifedi, so a starting spot for Evans might not be available. As of now, the Saints and contract-year quarterback still aren’t progressing toward an extension. Jahri Evans‘ contract suggests he’ll have to compete for a spot with the Seahawks, Sheil Kapadia of ESPN.com writes. With just $80K guaranteed on his ~$1MM deal, it’s a low-risk move for Seattle and they know that they can press the escape button with minimal consequences if he does not resume his old form. If Evans does look strong in practice, then he could possibly earn a starting job and bump rookie Germain Ifedi from right guard to right tackle. If he doesn’t provide much of an upgrade, then he won’t be on the 53-man roster. 49ers offensive lineman Anthony Davis still isn’t practicing with the starting unit, but he’s not complaining, despite his predilection for blasting the team in the past. “I’ve never played third team. It’s an experience,” Davis said (via Cam Inman of the Mercury News). “I don’t mind it. Coach (Tom) Higgins used to say at Piscataway (New Jersey) High School: ‘The cream always rises to the top.’ That’s how it always works out.” Speaking of New Jersey, some within the Giants have reportedly pushed for the team to deal for Davis, though we haven’t heard much on that front in the last week. Seahawks offensive lineman Germain Ifedi and Buccaneers defensive lineman Martin Ifedi have hired Tory Dandy and Jimmy Sexton of CAA Football for representation, Rand Getlin of NFL.com tweets. With Earl Watford out at least two weeks, the Cardinals‘ second unit ls lacking consistency in camp and Mike Jurecki of FOX Sports 910 (on Twitter) opines that the team could use some veteran depth on the O-Line. Earlier this week, we interviewed Bob Condotta of The Seattle Times about Marshawn Lynch and other key storylines from the Seahawks‘ offseason. The Rams are concerned about running back Tre Mason. Those who are criticizing the Seahawks‘ first-round selection of Germain Ifedi will come to regret it, offensive line coach Tom Cable told ESPN Radio (link via Sheil Kapadia of ESPN.com). Speaking of NFC West coaches, all indications are that there is no reason for worry about Pete Carroll’s immediate future with the Seahawks, despite a lack of chatter on his contract, Bob Condotta of The Seattle Times writes. Carroll turns 65 in September. This week, we learned that Nick Foles is unhappy with the Rams and coach Jeff Fisher indicated that the quarterback’s time in Los Angeles could be short-lived. Free agent wide receiver James Jones says that he would “love” to join the 49ers, though he’s not being picky at this stage of the offseason. Despite being selected at No. 13 overall, Laremy Tunsil is slotted at a foreign position to him. The Dolphins are currently planning to station the Ole Miss left tackle at left guard, Barry Jackson of the Miami Herald reports. A three-year starter with the Rebels exclusively at left tackle, Tunsil told media (including Jackson) he has never played guard but expressed willingness to line up anywhere on the Fins’ front. Branden Albert and Ja’Wuan James remain as the Dolphins’ tackles, leaving Tunsil to join Billy Turner on Miami’s first unit at guard. With Albert, James and Mike Pouncey in the fold, guard has been a troublesome spot for the Dolphins recently. Pro Football Focus graded the Dolphins as the league’s No. 31 line, ahead of only the injury-ravaged Chargers, with former starting guard Dallas Thomas receiving the site’s worst marks among its starters. PFF graded Miami as the league’s worst run-blocking line last season. Here’s more on Tunsil and the latest from the respective offensive fronts around the league. Although some expected the Lions to place Taylor Decker at right tackle considering 2012 first-rounder Riley Reiff has started on the left side for the past three seasons, the Ohio State blocker will begin his Detroit tenure at left tackle, according to Dave Birkett of the Detroit Free Press. Jim Caldwell did not specify the team’s plans for its first-rounder, but Decker lined up at that position during Saturday’s minicamp workout. Decker started 28 games at left tackle for the Buckeyes during the 2014-15 seasons but played right tackle as a sophomore. Birkett writes that Reiff’s future in Detroit could be tied to Decker’s ability to handle left tackle. Set to play this season on his fifth-year option, Reiff will be a free agent in 2017. Beyond Reiff, the Lions employ Michael Ola and 2015 seventh-rounder Corey Robinson. However, the team signed Geoff Schwartz to a modest accord in the offseason, and although he’s coming off two injury-prone seasons with the Giants, Schwartz has been a quality player at guard and right tackle when healthy. He may make the most sense to play right tackle if Detroit deems Decker its left tackle. The Seahawks are planning to slide Justin Britt from guard to center, Tom Cable told media — including Liz Mathews of 710 ESPN (Twitter link). Primarily a left tackle in college at Missouri, Britt will have now moved from right tackle to guard to center in his three seasons in the league if this transition sticks. Britt rated as PFF’s seventh-worst full-time guard last season. Seattle’s staff plans to begin Germain Ifedi‘s career at right guard, with the Texas A&M tackle’s next spot potentially being right tackle, according to an Associated Press report. The Raiders’ starting right guard for all 16 games last season, J’Marcus Webb is expected to return to tackle, where he began his NFL career with the Bears. The Seahawks have reached agreements with two more draft picks, most notably striking a deal with first-round offensive lineman Germain Ifedi, a source tells Adam Caplan of ESPN.com (Twitter links). Caplan also reports that the team has agreed to terms with third-round tight end Nick Vannett. Seattle locked up a pair of Day 2 picks earlier this week, agreeing to deals with second-round defensive tackle Jarran Reed and third-round offensive lineman Rees Odhiambo. After securing those four players, the Seahawks still have to sign six more players from this year’s 10-man draft class, but none of those contracts should be particularly difficult to negotiate. Ifedi, who was selected with the 31st overall pick after the Seahawks traded down from No. 26, figures to compete for a spot on Seattle’s offensive line immediately, either at guard or right tackle. Because the Patriots didn’t have a first-round pick this year, the former Texas A&M tackle represented the final pick of the 31-player first round, and will therefore be the last 2016 draftee eligible for a fifth-year option on his rookie contract. According to Over the Cap’s data, Ifedi’s four-year rookie deal should be worth about $8.265MM, with a $4.211MM signing bonus. The value of his fifth-year option for 2020 won’t be determined until 2019, when the Seahawks will have to make a decision on whether to exercise or decline it.